The Sierpinski triangle can be obtained by removing either triangle or square tremas. Both processes admit generalization. Not only the trema addresses can be defined more broadly, but an additional variety of the resulting sets can be achieved by permuting vertices of the remaining polygons. The first applet that realizes these ideas has been written to handle triangle tremas. The applet below tackles the square case. The applet allows quadrilaterals (of which the square is a particular case) to be split into 3, 4, 5, or 9 parts in a recursive manner. 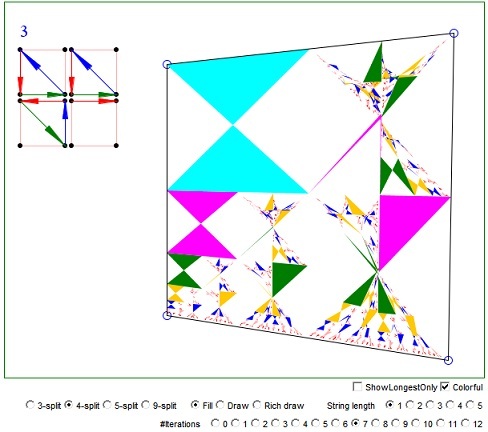 A special tool in the upper left corner of the applet identifies the selected partition and, more importantly, allows to specify vertex permutations for each of the quadrilateral pieces independently. Clicking on each of the parts cycles through a list of permutations ordered according to the Johnson-Trotter algorithm. Permutations are represented by arrows joining vertices of a quadrilateral. Clicking on the arrows causes a rotation of vertices involved in the cycle of which the arrow is an element. Trema address are defined by a string that may included one or more digits. This is defined also in the upper left corner just above the partition-permutation tool. The digits are clickable and their number is defined via controls at the bottom of the applet. Unmodified 9-split with the central square (#8) removed leads to the Sierpinski carpet, a remarkable fractal that deserves a page of its own. Once you got a hang of it, you may obtain other appealing fractals, like the square dragon below.